There are a lot of activities that are important for you to do with your children, from playing catch to indulging in the occasional make-believe game. But one of the most important things you can do for your kids as a dad is read to them. Here's why. Whether they're in school or kindergarten and first grade are right around the corner, reading is good for learning new words. Read to your kids early on and they'll get in the habit, which is one of the best ones they can have! Want your kids to settle down before it's time for sleep? Instead of turning on the cartoons, snuggle up in bed with a good book. Probably the biggest benefit of reading to your kids is simply spending time with them. It can be hard to fit lots of quality kid-time in during the day, and a chapter or two from a beloved book is a great way to do it. Fatherhood is a full-time job and then some. You probably haven't had much time for reading yourself. 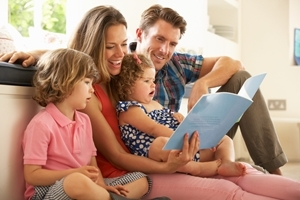 Sure, your kids' books aren't the latest Lee Child or Dan Brown thriller, but as your kids grow older, you can explore new and exciting books together that you loved as a kid.